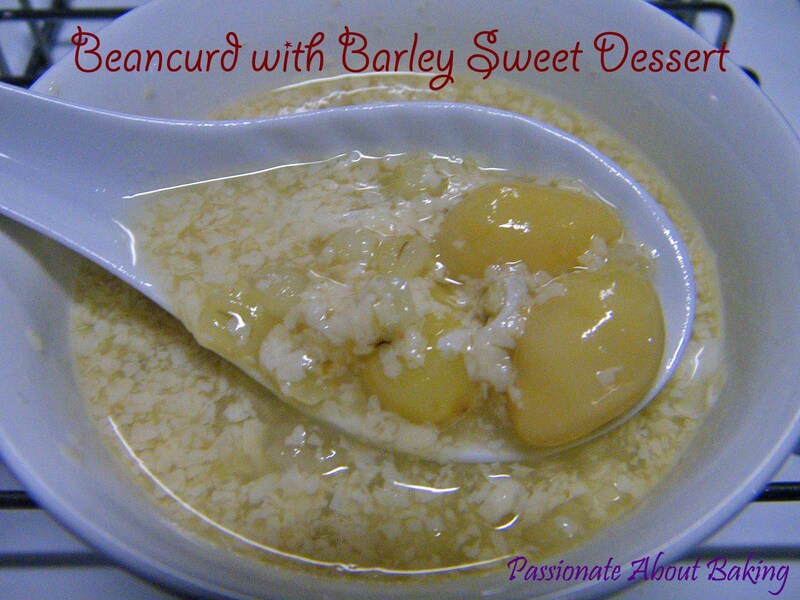 Recently, I have a liking for this dessert - Beancurd with Barley (Fu Chok Tong Shui). It started because one of my colleague only takes this dessert. I tried it once with her, and I like it very much. So I decided to learn how to make it. It's really easy. I think it's easier than Tau Suan. I've bought the bean curd sheets quite sometime back, and didn't get to do it till Sunday morning. Recipe for Beancurd with Barley Dessert (Fu Chok Tong Shui), modified from "dim sum mini cookbook series". 1. Cut soaked bean curd sticks into shorter lengths and place in a (thermal pot's) pot. 2. Add all other ingredients except eggs. 3. Bring to a boil and simmer for about 30mins*. 4. Pour in the egg into the soup in a slow steady stream and stir in a single directoin to form thin ribbons. 5. Turn off the heat and place it in the thermal pot to let it continue heating. ~ If you don't use thermal pot, then let it simmer for at least 1hr 30mins, until the beancurd breaks up. After 1.5 hours in the thermal pot, the beancurds broke up till very fine. ~ I used egg whites as I have abundance of them in the fridge. ~ I used a mixture of Holland and China barleys. ~ You may adjust the rock sugar according to your liking. looks good. never tried it before..yumm. this is one of my favourites since young!! I like this dessert very much too. It is a good idea to use thermal pot to cook this dessert. Sometimes I will "cheat" by adding add soya milk to achieve the creamy soup. After seeing this tong shui pic, I tell myself that I must make this by this week.